A Slice of Brie: "Every child in our world will know his name!" So before we all started this Harry Potter readalong, there was a lot of Harry Potter talk, and all I could think about was how overwhelmed I was not knowing much at all about the wonderful world of Harry Potter. BUT NOW. Now, it's all starting to make sense! Yay, soon (like the next few months soon), I will no longer be living under this rock where all I know is Harry Potter's name. While I have this vague feeling while reading this first book of having read it before, I really don't remember much of it at all. Other than poor Harry living under the stairs for the first 10 years of his life. This week we read Chapters one through nine. And while I couldn't possibly provide any spoilers for things to come, spoilers are inevitable for what has already been read. So consider yourself warned. Although I'm pretty sure this isn't going to be an issue for like anyone. - When JKR wrote that quote, do you think she had any idea just how famous Harry Potter would really become? It's amazing really - to think about writing a series of books that would become so famous that literally everyone has heard of them. - Oh god The Dursley's are the most infuriating people EVER. I wanted to reach through the pages and grab them all by the scruff of their necks and shake 'em. My blood pressure literally rose when Harry kept receiving all those letters and Mr Dursley kept intercepting ALL OF THEM. I really hope Harry casts a spell on them later on. Why did Dumbledore leave Harry with the awful Dursley's for SO LONG? Why was it so necessary that he be "raised" (and I use that term loosely because he wasn't really raised - he was pretty much neglected) by blood-relatives? Would Harry going off to Wizard school not seem as exciting to the reader had he been raised in a loving household? Or was JKR just following the whole orphan-hero theme that is so common in so many children's stories (Pippi, Series of Unfortunate Events, James and the Giant Peach, Hugo Cabret, etc). I mean, I like Harry right away, but is that because I feel compassion and empathy for what he's been through? Is that the whole point? - When Harry figured out he could talk to the snake at the zoo, I pictured the snake from The Jungle Book. I'm sure that snake didn't get far - much like Alfred The Turtle. - We meet Hagrid! And I love him. I love that he gets to give Harry hope that there's actually a whole other life waiting for him outside of the sheltered one he's living with the Dursley's. And he brings Harry a birthday cake and buys him his owl for a birthday gift, knowing very well that Harry's never gotten anything for his birthday before. Tell me that isn't sweet! - Oh Ron and Hermione. I mean, I know they all become great friends (well, I'm assuming this based on the film previews I've seen), but Hermione - you are SO annoying. And SO bossy! I'm assuming she becomes more tolerable as the books go on...and by "as the books go on", I mean, it better happen in this book. - All the first year students take turns sitting under the sorting hat to see which house they get placed in. (Now I get all this house talk!). Does Harry's dream (that he doesn't remember when he wakes up) about how he must transfer to Slytherin because that's his destiny, foreshadowing events to come?? Hmmm. Don't answer that. - I do not remember Snape, but I do not like him. - Harry's a natural at broom-flying. When I got to the end of chapter 9, there was an old bookmark in the page from when this book was last read over 10 years ago. In the same spot that this part of the readalong ended! It's like I knew I'd be back one day. Lauren and I read them at the same time for the first 4 or 5 books. It was a fun way to read together, like our own private book club. Yay for Harry Potter! I've reread the first one through audiobook, and hope to continue through the series! 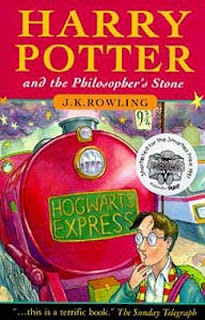 I can't believe how addicting these books were ... And the movies were so faithful to the books! Awwww, I love that the bookmark was that all READY for you! THINGS have been happening that prove this readalong was totally meant to be. And by THINGS, I mean that and also the fact that I haven't read the books for FOUR AND A HALF YEARS for no good reason. Except that I was clearly waiting for this. I haven't seen the films (or, ok, I've seen the first one and the sixth one and parts of the others) but ZOMG teeeeeeny Daniel Radcliffe et al! So sweet! All three of them are so teeny and cute and I just want to squish their faces in my hands! Really, Laura?? You haven't seen the films?! I assumed everyone's read the books AND seen all the films. Maybe you need to read a book, watch a movie, read a book, watch a movie, etc, too! :) Everytime I visit my sister-in-law and nephews she tries to get me to watch them but I'm always like "I CAN'T", not before I read the books. Hagrid is the best and SO SWEET buying him the owl and bringing him a birthday cake, and giving his cousin a pig tail. I like to think that was sort of a birthday gift as well. Haha yes, the pig tail was definitely a birthday gift as well! Lol, that's funny. You just got an early start! I hope you make it through this time!! That last gif! I can not handle the cuteness. I love that quote. I think JKR knew, or at least had a feeling that, these books were going to be big. I'm so glad you're reading this! I hope you're liking it. It really blows my mind to think about being able to come up with such an amazing story and ideas. I mean, I struggle to write blog posts sometimes! Haha. WHAT!? Seriously? That shocks me, Jenni! I thought for sure you had read them! You should totally read along with us - even if you don't want to have posts about it, you can still read with us :) DO IT. Hagrid is the sweetest, most awesome and amazing character ever. Everything he does for Harry is just so heart-warming and thoughtful, he's just a beautiful person basically! He really is, isn't he! I keep thinking, "why didn't he just raise Harry after his parent's died?!" SUCH a good observation about Rowling's somewhat prophetic paragraph there. I think about that all the time. I mean, by the second book, I'm sure she realized it was gonna be huge...and so did her publisher. But it would still be so WEIRD to watch it grow and grow and grow and become a separate entity almost. Art is crazy like that. I'm glad you're enjoying your first read as much as I am! Art *IS* crazy like that! I can't even imagine being able to come up with an idea like "Harry Potter", let alone having said idea become world-famous! How is Harry not incredibly bitter after living in a cupboard for 10 years? If I were raised by the Dursleys, friendless, and bullied constantly, I would have turned out to be the bitterest misanthropic kid in all of Great Britain. Kid came out surprisingly "normal". YEs! Exactly. He's still like the nicest boy around. In normal life, he'd be like the biggest bully EVER!